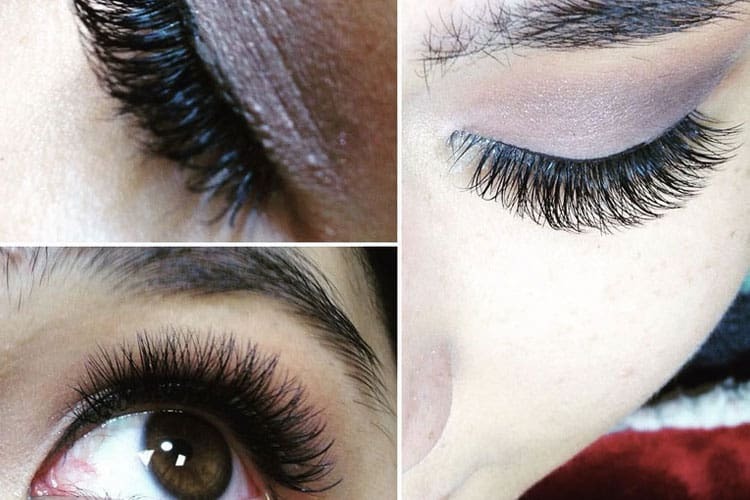 Recommended services if you're new to eyelash extensions and want to test it out. Recommended services if you currently have eyelash extensions from other locations. Velvet Lash is a luxurious eyelash extensions lounge serving Roswell and Alpharetta area. We only use the highest quality products and will deliver the best service by our professional Xtreme certified stylists that truly care about your eyes. We are so grateful to work with many beautiful brides. Here is one of our favorite bride in 2018, Amanda. She's a kind hearted nurse who looks stunning on her wedding day wearing our Velvet Lash Mega Volume. Post your daily life-style photos on Facebook if you want to be featured on our site. We use the highest quality products to ensure your lashes stays longer and safer on your natural lash. Our stylists are licensed esthetician/ cosmetologist and are certified lash experts to ensure the best techniques are applied. Velvet Lash continues to receive 5-star ratings and recommendations on our social media; Google, Facebook and Yelp. Whether you are new to eyelash extensions or have issues with your current salon, we are here to provide you free consultation before and after your visit with us. Our clients are ecstatic with our services. If you are unsatisfied with your eyelash extensions, please reach out to us. We strive to understand the look you want to achieve so that we can exceed your expectations. Consult with our friendly and professional stylists which look you want to achieve. Each natural lash will get single eyelash extensions. You will get up to 80 lashes per eye and could take up to 2 hours to complete. With the classic set, your lashes will look enhanced with mascara on. Multiple 2-5 thin eyelash extensions attached to a single isolated natural lash. You will get up to 375 extensions and takes about 2 hours to complete. It'll give you a fuller and more natural looking lashes. Each natural lash will get up to 10 ultra thin eyelash extensions. You will get up to 700 extensions per eye and could take up to 2.5 hours to complete. Recomended for brides, bridal parties, and special event-goers. Vivian is easily the best eyelash artist in the Atlanta area. My lashes look great every time, even when I go in to get a refill. She takes her time, is clean and very very thorough. Her studio is so calming and relaxing. I absolutely love going there! I would recommend her to anyone out there looking for a set of eyelashes that will blow you away! I have always wanted luscious, full volume lashes and now I have them. Jill is beyond incredible! She's personable and a total pro when it comes to Volume Lashes! Her attention to detail is unmatched! If you want statement lashes with no fuss, go see Jill at Velvet Lash! I promise you will love yours as much as I love mine! Vivian is the best lash expert and I have seen a few in various cities. I have been seeing her for three years and she constantly does an amazing job-- her lashes look natural and they stay on a LONG time! Her studio is super clean and comfortable and she is great to chat with and super personable. I get lots of compliments on my lashes. Thank you Vivian! Had my first set of lash extensions put on two days ago with Mia at Velvet lash and my experience here has been superb! As a newbie, I had lots of questions and the owner Vivian was quick to respond by text to answer them in advance. I decided on a volume set on my first go for the drama as a frequent wearer of false strip lashes, the look turned out perfectly! I had to return the next day to have some lashes adjusted (not their fault, I have crazy natural lashes that don't grow in even directions) and again Vivian was so quick to respond and have Mia correct them exactly as I needed them to be! I don't have another experience to compare them too, but if you're looking for a quiet, clean, calm, personable experience with great communication between clients and Service then I highly recommend Velvet Lash! I will definitely be back. I couldn't have asked for better service or quality when I visited Vivian. I'm a very picky person and I place quality at the top of my list when receiving any sort of service, and Velvet Lash didn't disappoint when it came to that. I got my lashes done for my engagement session a week and a half ago and my lashes still look exactly like they did the day I got them done. I wasn't sure if I would keep maintaining them, but seeing how well they're holding up and will continue to hold up, I will most likely get fill-ins! And this rate, they will only require monthly fill-ins since I don't see them budging anytime soon. If you're not close to her salon, it's definitely worth making the drive for all the reasons above! I highly recommend Vivian! I have very sensitive eyes and bad allergies and voiced my concerns and she answered all of my questions and made me feel 100% confident I wouldn't have any issues. My lashes look AMAZING and feel weightless, she's very knowledgeable and asked a lot of questions about what was important to me in my lashes. I am beyond in love with Vivian's artistic ability to make me look good!!!! The lashes she has given me for the last few years bring me compliments on a daily basis. She is nothing short of a perfectionist and a professional. You have to get your lashes done by Vivian in her new beautiful Salon!!!!!! Go Now! Vivian was wonderful to work with, very friendly and professional, she took care to consult with me about my sensitivity to certain adhesives, and checked in with me after to ensure all was well. She did a beautiful job styling my lashes. Highly reccomend. Perfect service, professional, and I leave with a fabulous look. Vivian is my only trusted lash technician in the Atlanta area. When she moves, I move. Her patience and care for the health of my eyes and lashes is what I appreciate the most. She makes sure that special products are used for my sensitive eyes, including my take home lash care. My look is tailored for my eye shape and I always get compliments. I can do different looks with Vivian's techniques. Whether I want to go for glam or natural, Vivian knows exactly how to achieve my desired look. If I could give her 10 stars I would! Love!!!! Vivian was amazing and my eyes look even more amazing... 10+ Stars. This was my first time here and she took time to explain things and made sure I was comfortable. 5-Star review is not enough? Velvet Lash is also highly recommended by other stylists and studio. We're proud to work with these amazing ladies to get the look fits with their life-style.